It’s that time of year again; the feeling of the Earth trembling your feet, the sound of thumping hooves stretching for miles, and the sight of massive herds of wildebeest coating the African plains as they migrate across the land during their most treacherous annual journey. The Great Migration is one of the most sought-after events for nature enthusiasts to experience, and with good reason; it is considered to be one of the greatest wonders of the world. Read on to learn more about the Great Migration and how you can witness this incredible event. What is the African Great Migration? 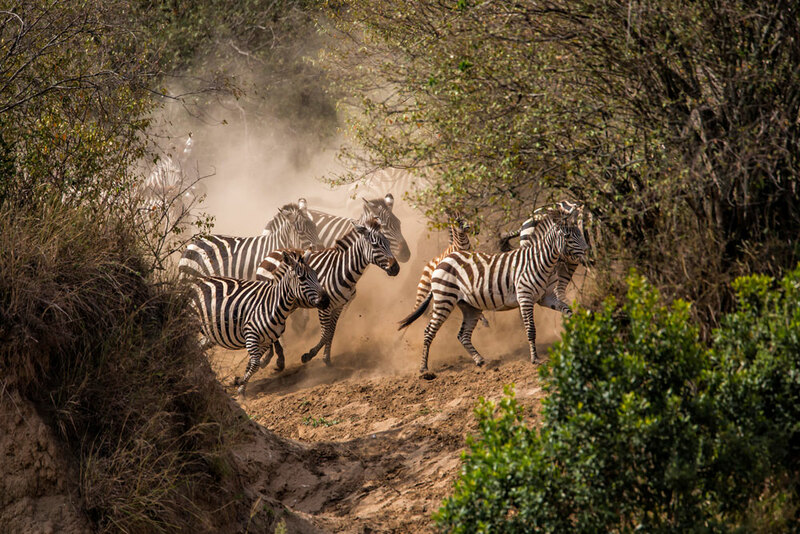 The African Great Migration is an annual event where zebras, wildebeest, gazelles, and other animals make their way across Tanzania and Kenya through African plains, the Serengeti River, and the Mara River in search of food. This journey, however, will not be without danger; lions, hyenas, leopards, and other large predators are present to run down their prey. Additionally, during river crossings, animals part of the Great Migration will need to fight off crocodiles and heavy currents. As you can imagine, this expedition is one of epic proportions. This migration is the largest mammal migration in the world; over two million mammals are a part of this movement. In addition to migrating in search of food, this is also a time where the wildebeest are known to give birth, otherwise known as “calving season.” During this time, almost 8,000 wildebeest can be born per day. Wildebeest mothers instinctively give birth in shorter grass so prey is easier to spot, and baby wildebeest eat the fresh, nutritious grass while zebras snack on what’s left of the plains. Though the migration happens year-round, it is tricky to try and pinpoint when and where you’ll see the wildebeest, even if you’re familiar with the migration cycle and map. For anyone who wants the best chance of witnessing the migration in action, there are two main places that you’ll be most likely to see this life-changing event. Serengeti National Park: This location is the most famous for witnessing the Great Migration. As wildebeest and zebra begin to congregate, it is most likely that you will see them while staying at Serengeti National Park. This is a Tanzanian national park located in the Serengeti ecosystem, which houses features of climate, vegetation, and regional animals that have not changed for at least a million years. If you want the best chance to see animals of the migration, this is the place you need to be. Maasai Mara National Reserve: There are many camps and lodges located in Maasai Mara because one of the most desired spectacles to see is the wildebeest crossing the Mara River. It is during this time people can see nature at work: thunderous herds storming through the water, young wildebeest too tired to make it fully across, crocodiles claiming the lives of the weakest wildebeests, and so much more action. It can take hours to wait for the wildebeest to cross, but once they begin, it is a scene that will be unforgotten. 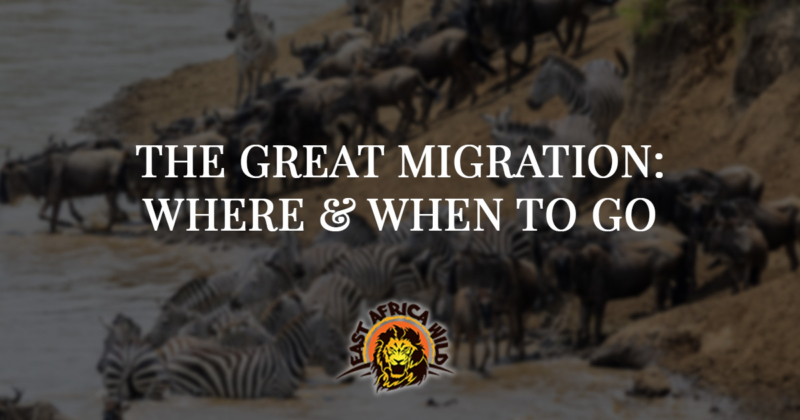 Since the Great Migration occurs all year round, it is possible to watch it at any given time; however, there are certain timeframes that are more recommended than others based on the likelihood of witnessing river crossings, herd movement, and other talked-about events. July – October: During these months, this is when we typically see the crossings of the Mara River. The wildebeest are in the northern Serengeti plains, and you have a chance of seeing up to thousands crossing the great Mara River. Since the sight of the wildebeest crossing the river is one of the most desired events to see, this is likely and most widely considered the best time to see the migration. December – March: It is during this time the wildebeest are located in the southern area of the Serengeti. They then disperse everywhere, grazing on the grass and typically giving birth during calving season in February. 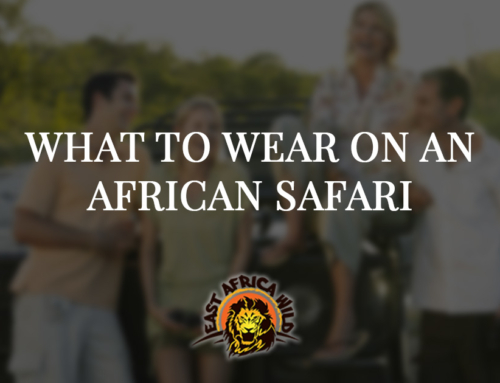 It is recommended to go during this time if you’d prefer to see the wildebeest congregating together in herds, sweeping the south plains and grazing. 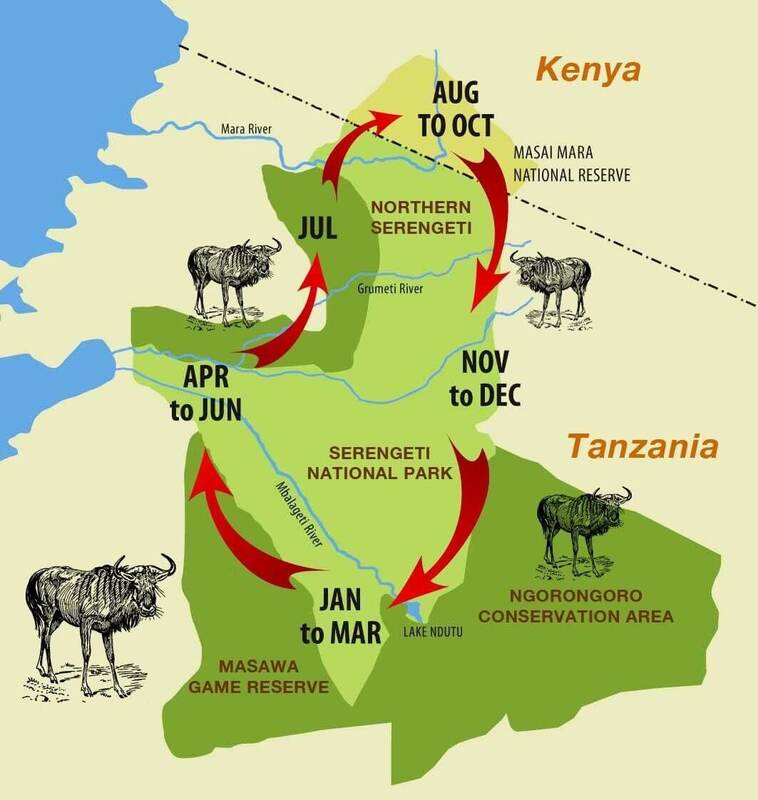 April – June & November: These months are when wildebeest are in interim locations and are on the move. This is a time where you would be likely to see the act of migrating, but in smaller herds than usual. It rains slightly in November, and April – June brings longer rains, which bring about fresh, green grass and more dispersed groups of animals. This is a time to see movement, but not a movement at a larger scale with condensed herds. No two migration cycles are the same, but there are certain instances and things you could see that are pretty consistent with each annual movement. 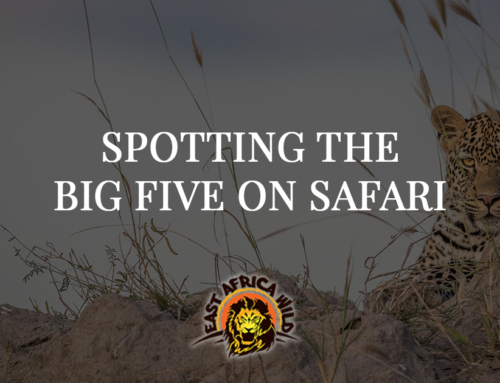 The wildlife: If seeing the Big Five is a part of your list, you may be able to cross that off while witnessing the Great Migration. In addition to seeing giant herds of wildebeest and zebras on the move, you’ll also see the other animals that are attempting to chase their prey: lions, leopards, hyenas, cheetahs, and more. 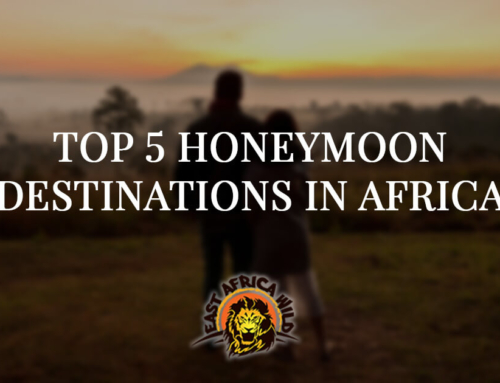 And since this phenomenon is across such a vast area of land, it is very possible that you’ll see elephants, rhinos, and other wildlife, too. 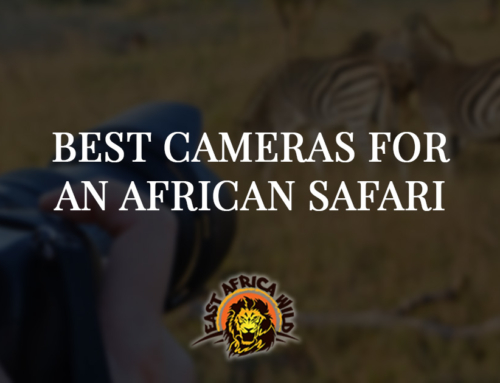 So have your camera ready and do not expect to only see wildebeest during this movement. Calving season: As mentioned, this is the time when wildebeest give birth over the duration of several weeks. This event is strategically timed, as it is to overwhelm concentrations of prey during the next movement. While young wildebeest are overcoming the challenge of learning to run, mothers are grazing on nutritious grass to provide the best nutrients for their babies. This is a highlight if you are an animal-lover who is anxious to witness new wildlife be welcomed into the world. River crossings: One of the most anticipated events of the Great Migration, the wildebeest crossing the Mara River is typically dictated by the weather. Any unusual change in weather can throw off river crossings by a few weeks, but if you’re lucky enough to catch this event, it’s sure to be well worth the wait and patience. This is considered to be one of the most emotional events during the Great Migration, as it is action-packed and is the epitome of wildlife in its natural habitat. The Great Migration is a once-in-a-lifetime event that is unforgettable. Millions of people attempt to witness the migration every single year, and its popularity is not slowing down anytime soon. 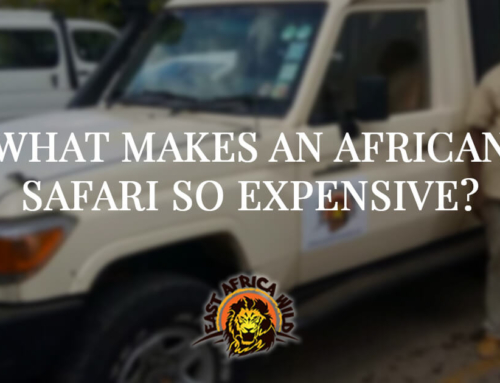 To see the tours we offer that will greatly heighten your chances to seeing the best sights during the Great Migration, visit this page and plan your itinerary to start this incredible journey! 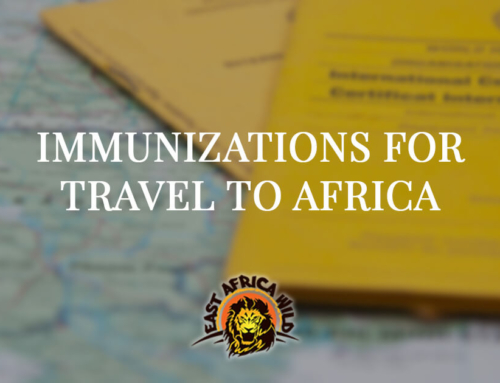 Interested in Learning More About a Great Migration Safari? View Our Great Migration Tours or Contact Us Today to Get Your Questions Answered.